The South African government lashed out at President Donald Trump on Thursday after he tweeted that his administration would be looking into farm seizures and the "large scale killing of farmers" in South Africa. The government said Trump's tweet was based on "false information" and reflected a "narrow perception which only seeks to divide our nation and reminds us of our colonial past." It said it was meeting with the U.S. Embassy on Thursday as it seeks to clarify Trump's remarks. South Africa's presidency summoned U.S. charge d'affaires Jessye Lapenn to protest Trump's tweet, a person familiar with the matter said. Foreign Minister Lindiwe Sisulu said she would be seeking clarification from the United States over the "unfortunate comments." Today, nearly a quarter-century after the first democratic elections, black South Africans, who comprise 80 percent of the population, still own just 4 percent of the country's land, according to the government. Though the ruling African National Congress, which has been in power since 1994, has pledged to close that gap, progress has been slow. In July, President Cyril Ramaphosa said his party would amend the constitution so the state could expropriate land without compensation to speed up the land reform process. Trump's tweet followed a segment on Fox News on Wednesday in which host Tucker Carlson claimed Ramaphosa had already started "seizing land from his own citizens without compensation because they are the wrong skin color," calling the alleged seizures "immoral" while describing the South African government as "racist." "I have asked Secretary of State @SecPompeo to closely study the South Africa land and farm seizures and expropriations and the large scale killing of farmers ... @TuckerCarlson @FoxNews," Trump's tweet read. Experts say the attacks reflect the country's generally high crime rate and that there is no evidence connecting them to victims' race. In 2016-17, there were 74 murders that occurred during farm attacks, according to Africa Check, compared to 19,000 murders across the country in the same period. Agricultural organization AgriSA said earlier this year that farm murders were at a twenty-year low, with 47 murders over a one-year period in 2017-18. Malema, who heads the radical left-wing Economic Freedom Fighters (EFF), dubbed Trump "a pathological liar." "Donald 'the pathological liar' Trump, we are not scared of you and your USA or Western imperialist forces," he said at a press conference. "Everyone in South Africa should hope that the pressure from the USA will lead to the (ruling party) reconsidering the disastrous route that they want to take South Africa on," AfriForum's CEO Kallie Kriel said in a statement on Thursday. AfriForum and other critics of the government's proposal to expropriate land without compensation say the policy could lead to economic disaster, pointing to the collapse of the agricultural sector in neighboring Zimbabwe after the government of former President Robert Mugabe began seizing white-owned farms, sometimes violently, in 2000. 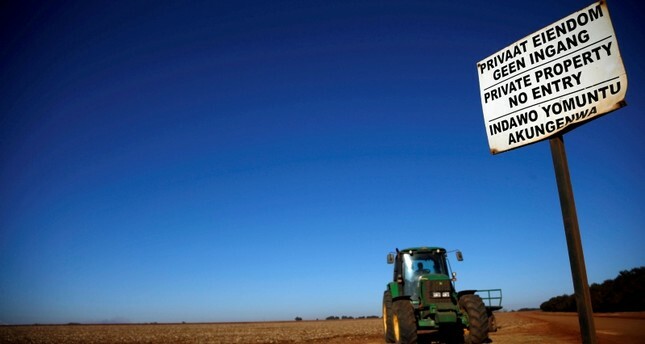 Proponents of South Africa's land expropriation policy, including Ramaphosa, say it is necessary to address the country's historic injustices and can be done in a way that is lawful and will not compromise the beleaguered economy or food security. Trump who drew ire on the continent earlier this year when he labelled some African countries "shitholes." Earlier this year, Australia also caused a diplomatic tiff with Pretoria after Home Affairs Minister Peter Dutton said white South African farmers who wished to migrate should receive fast-track visas. Ramaphosa has said his land reform programme will be carefully carried out, to avoid what happened in Zimbabwe when former President Robert Mugabe's farm seizures sent the economy into a tailspin. However, the South African president noted earlier this week that left unaddressed, the land issue would "cause instability," the South African press reported. People on South African social media were having a field day with Trump's controversial comments on Thursday. "A nation that illegally invaded countries like Iraq to grab oil, and still has land reservations for indigenous Americans, is not morally qualified to interfere in SA and our domestic land issue," tweeted one user, Simon Grindrod.